City of Lights | So Many Exciting and Beautiful Places! We arrived last night at Conflans-Sainte-Honorine, not far from Paris. 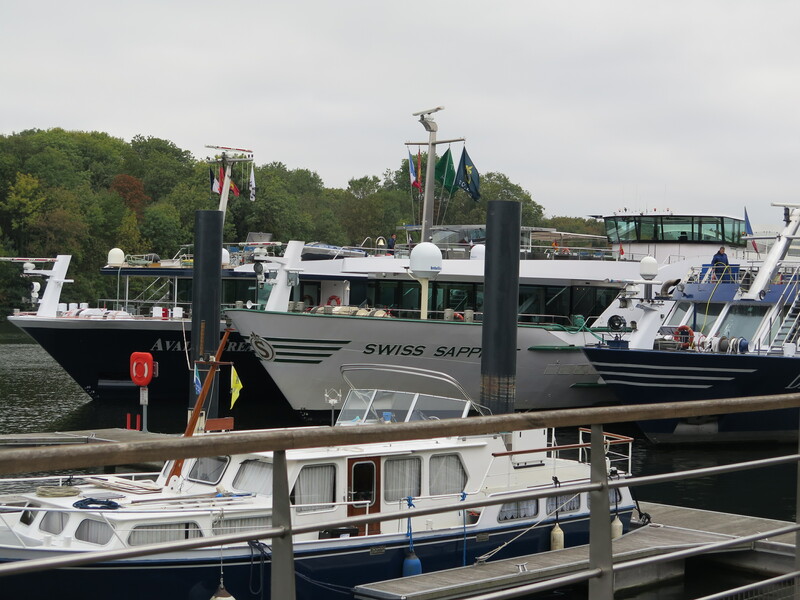 There are several cruise boats on the Seine, and we were triple parked at the dock. To get to land, we have to traverse the other two boats, so we get to do a little snooping on the way. On the other hand, this often means our cabin window faces that of the neighbor – not much privacy! Our boat is triple parked. We also visited a local open air market, which offered clothing items, fresh fish and vegetable, and even mattresses for sale! Further exploration took us uphill to a battlements museum. Although we didn’t go into the museum, we certainly enjoyed the views from above the town. We could even see the skyscrapers of Paris in the distance. After lunch, we took a tour to Chateau de Versailles. The Palace and gardens there are simply immense, covering 17 acres. Almost everyone in France was visiting at the same time that we were. Seeing the long lines made me grateful for preferred access with our tour group. However, once we were inside, it was wall to wall people. It was very difficult to see anything, and the heat drove us outside before the tour was over. Louis XIV at age 27. Nice locks! The gardens, commissioned by Louis XIV in 1661, were also immense, with views that stretch for miles. There are numerous fountains, which are turned on each Saturday and Sunday. Music plays throughout the gardens as well. It was very refreshing to walk outside after being in the crowded palace. The gardens were heavily damaged by storms in 1999, but several sections have been restored to their original appearance since then. After we returned to the boat, we sailed into the heart of Paris. At 9:00 pm, we all went to the top of the boat for an excellent view of France’s Statue of Liberty, a small copy (37’8″) of the one they gave to us. This small statue was a gift from the United States to France on the 100th anniversary of their republic. She stands in the Seine, facing west toward our own Lady Liberty which faces east towards France. At the top of each hour, the Eiffel Tower’s flashing lights are turned on for 5 minutes, and the tower is a sparkling wonder – not to be missed. The highlight of the day was the evening tour of the lights. We stopped first at the Eiffel Tower in time to see the light display up close. Then, to the Place de la Concorde, an historic square and the site of Marie Antoinette’s execution by guillotine. Now, there is a 3200 year old obelisk from Luxor, as well as several lighted sculptures. This location afforded a wonderful view of the Arc de Triomphe at the other end of the Champs-Elysees. We drove by the Arc de Triomphe on our way to the Louvre, where the glass pyramid was lighted. We can certainly understand why Paris is called the City of Lights. This entry was posted in Europe, France and tagged Eiffel Tower, Versaille. Bookmark the permalink.